A highly aromatic, densely concentrated, incredibly spirited Pinot. Aromatics of raspberry, strawberry, hibiscus, Oolong tea, clove, jasmine and pink flowers are effusive. The palate is full of finesse with a beautiful, graceful texture and fine tannins, framing deep yet directional flavors echoing the nose. 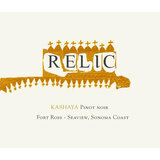 The finish is elegant, as Kashaya always is, leaving plenty of room for the long flavors to linger. Medium ruby-purple colored, the 2015 Pinot Noir Kashaya offers up lovely red cherries, vibrant cranberries and roses scents with touches of dried herbs and underbrush. Medium-bodied, elegant, edgy, fine and refreshing, it has a pleasantly chewy backbone and good length.